While Europeans may open a history book to learn about their past, in the Luba Kingdom of the Democratic Republic of Congo, history was traditionally performed—not read. In fact, Luba royal history is not chronological and static as Westerners learn it. Rather, it is a dynamic oral narrative which reinforces the foundations upon which Luba kingship is established and supports the current leadership. This history is also used to interpret and judge contemporary situations. Special objects known as lukasa (memory boards) are used by experts in the oral retelling of history in Luba culture. The recounting of the past is performative and includes dance and song. The master who has the skill and knowledge to read the lukasa will utilize it as a mnemonic device, touching and feeling the beads, shells, and pegs to recount history and solve current problems. The Luba Kingdom of the Democratic Republic of Congo was a very powerful and influential presence from the sixteenth to the early twentieth centuries in central Africa. Their art highlights the roles that objects played in granting the holders the authority of kingship and royal power. The Luba people are one of the Bantu peoples of Central Africa and the largest ethnic group in the Democratic Republic of the Congo. The Kingdom of the Luba arose in the Upemba Depression (a large marshy area comprising some fifty lakes) in what is now the southern Democratic Republic of Congo. The Luba had access to a wealth of natural resources including gold, ivory, and copper, but they also produced and traded a variety of goods such as pottery and wooden sculpture. For the Luba people, kingship is sacred, and the elite Mbudye Society (whose members are considered “men of memory,” and who have extensive religious training) use the lukasa to recount history in the context of spiritual rituals. Diviners (who have the power to predict the future) can also read the lukasa. Each lukasa is different but small enough to hold in the left hand. The board is “read” by touching its surface with the right forefinger. The tactile qualities are apparent. 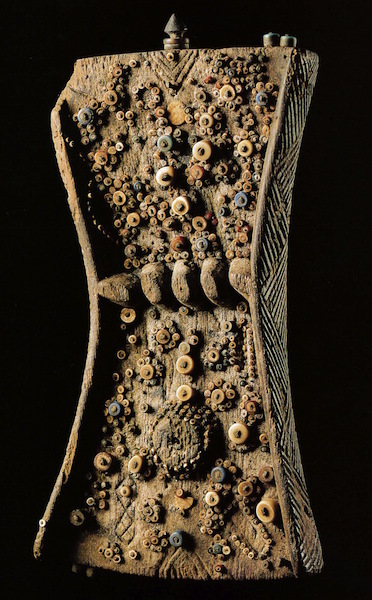 The lukasa illustrated here is one of the oldest known examples, with carved geometric designs on the back and sides, and complex clusters of beads of various sizes whose colors have faded over time. The board is narrower at the center making it easy to hold. The lukasa is typically arranged with large beads surrounded by smaller beads or a line of beads, the configuration of which dictates certain kinds of information. This information can be interpreted in a variety of ways and the expert might change his manner of delivery and his reading based upon his audience and assignment. The most important function of the lukasa was to serve as a memory aid that describes the myths surrounding the origins of the Luba empire, including recitation of the names of the royal Luba line. Cite this page as: Juliet Moss, "Lukasa (Memory Board) (Luba peoples)," in Smarthistory, November 28, 2015, accessed April 21, 2019, https://smarthistory.org/lukasa-memory-board-luba-peoples/.